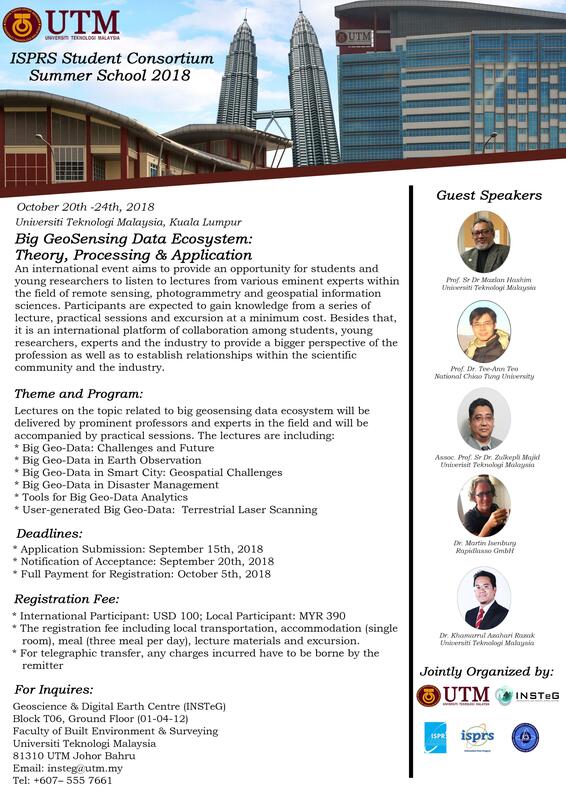 We are happy to invite students and young researchers to participate in ISPRS Student Consortium (ISPRS SC) Summer School 2018 on Big GeoSensing Data Ecosystem: Theory, Processing & Application, to be held on October 20th to 24th, 2018 at Universiti Teknologi Malaysia, Kuala Lumpur Campus. ISPRS SC Summer School 2018 is a collaborative program among the ISPRS, ISPRS SC, Asian Association on Remote Sensing (AARS), Geoscience & Digital Earth Centre (INSTeG), Universiti Teknologi Malaysia that aims to build the capacities of students and young researchers in the field of remote sensing, photogrammetry and geospatial information sciences. This initiative is an international platform of collaboration among students, young researchers, experts and the industry to provide a bigger perspective of the profession as well as to establish relationships within the scientific community and the industry. This summer school provides an opportunity for students and young researcher to listening to lectures from various prominent professors and experts within this profession. Participants are expected to gain knowledge from a series of lecture, practical sessions and excursion at a minimum cost. It also provides a platform to the participants to communicate with the experienced professors and industry experts apart from interact with participants from different countries to widen their professional networks. The design of the summer school program is based on lectures and practical sessions. Lectures on topics relevant to big geosensing data ecosystem will be delivered by experienced professors and experts in the field and will be accompanied by practical sessions. The practical sessions are not limited to learning through computers, but may also include group discussion that will challenge participants to think off real world problem and improve their presentation skills. Industry experts will be invited to showcase their latest technology or software for data acquisition and data analytic in remote sensing, photogrammetry and geospatial information sciences. The students and young researchers, who are the future users of technology and software are expecting to obtain latest technology updates from this technical demonstration that will be conducted by the industry experts. The registration fee including local transportation, accomodation (single room), meal (three meal per day), lecture materials and excursion. For telegraphic transfer, any charges incurred have to be borne by the remitter.